Topographical Descriptions. John Collinson, the Rector of Long-Ashton and Somerset’s Surveyors. 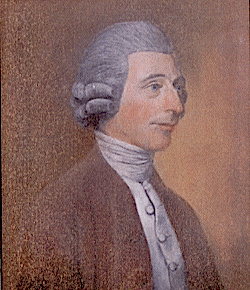 The Case of Edmund Rack: Quaker, Poet, Antiquarian. THE HUNDRED OF CARHAMPTON [in which Culbone lies]is situated in the northwest part of the county, and is bounded on the north and northwest by the sea and on the west by the borders of Devonshire. This mountainous tract may be called the Alps of Somersetshire; the whole country being a picturesque assemblage of lofty hills succeeding each other, with deep romantick vallies winding between them, in which most of the towns and villages are situated. The hills are principally sheep-walks; but in the western part many of them are so covered with heath, fern, and moss, as to afford little pasturage. The steep sides of most of them are either entirely vested, or patched with beautiful hanging woods, intermixed with projecting rugged rocks. The vallies are fruitful, and generally watered by small streams, running over rough rocky channels, and often interrupted by stony fragments fallen from the mountains. – John Collinson, The History of Somersetshire, 1791. WHAT HAPPINESS IT might have given me had the world of my poem belonged properly in Kubilai’s empire! And yet how misguided. For what could I touch of Shang-du and the gorges, mazings, rivers, gardens, pastures I’d imagined? But all I can claim is that I stretched my verses, in their flexible ductility, across that chasm separating Culbone Wood from Xanadu. Here then, in this parish, is my proper station – almost new to me as Xanadu, albeit closer – and at a damp end of the rainbow bridge which reached me back, estranged or de-ranged, many unfamiliar centuries. And my theme lies, indeed, in this domesticated situation: for my rhyming was engendered not in Shang-du or Serinde, but rather arose from this home-spun region. For while in my dream, I travelled to Cathay, my poem belonged finally and first in Somerset’s Carhampton Hundred. And why, afterall, should I shog off this little parish at the west end of our county on some pretension I had travelled eastward – when most I knew of that horizon was what I’d read in Purchas, Marco and some little passages of Sanskrit? Let me then quote from two publications that have come to hand, both written near the time of my own visit. First, from Rev. 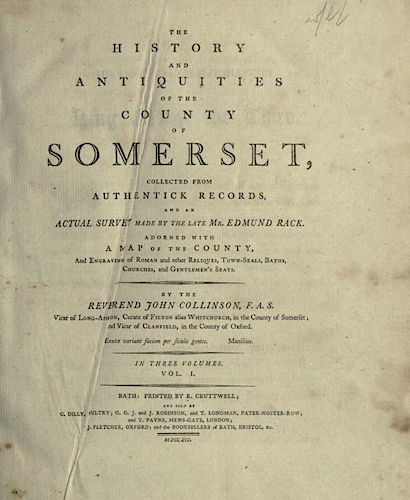 Collinson’s Somerset History and Antiquities. This followed by the Greenwoods, County Surveyors, who delineated Somerset. A very small parish on the sea coast, nine miles west from the town of Minehead, containing only nine houses and fifty inhabitants. The lands consist of eighty acres of arable, and two hundred acres of pasture and furze-brake, the rest is wood. …in the time of king Edward it gelded for one hide, and one virgate. The arable is two carucates. There are two villanes, and one cottager, and one servant with one plough, and fifty acres of pasture, and one hundred acres of wood. It is worth fifteen shillings. The church is a small Gothick building, thirty-four feet long, and twelve feet wide, consisting of a single aisle, chancel, and porch, covered with Cornish tiles. The situation of this church is singularly romantick; it stands in a little narrow cove, about four hundred feet above the level of the water. On each side of this cove the hills rise almost perpendicularly more than twelve hundred feet high. That on the west side is conical, and considerably higher. The back of the cove is a noble amphitheatre of steep hills and rocks, which rise near six hundred feet above the church, and are covered with coppice woods to the tops. The trees that compose these vast plantations, set by the hand of nature, are oaks, beech, mountain ash, poplars, pines and firs, mingled together in the most wanton variety. 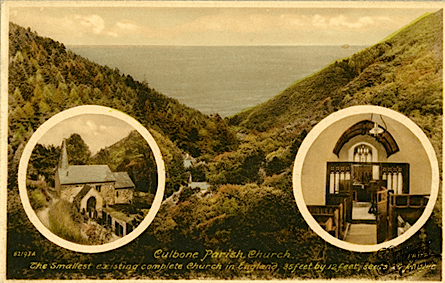 At the back ground of this cove, through a steep narrow winding glen, a fine rivulet rushes down a narrow rocky channel overhung with wood, and passing by the church, forms a succession of cascades in its descent down the rocks into the sea.The spot is as truly romantick as any perhaps which the kingdom can exhibit. The magnitude, height, and grandeur of the hills, rocks, and woods, at the back and on each side of the cove; the solemnity of the surrounding scene; the sound of the rivulet roaring down its craggy channel; the steep impassable descent from the church down to the beach; the dashing of the waves on a rough and stony shore at an awful distance below; the extent of the channel, and finely varied coast and mountains of Wales beyond it; form a scene peculiarly adapted to strike the mind with pleasure and astonishment. The parish cannot be approached on horseback without great difficulty, and even danger; the road from Porlock being only a path about two feet wide, winding in a zigzag direction along the slope of the hills, and often interrupted by large loose stones and roots of trees. The woods abound in whortleberries, and a variety of fine polybodies, lichen, and other mosses, among which is some of the yellow rein-deer moss, very bright and scarce. There are also some rare plants; and many wild deer, foxes, badgers, and martin cats, inhabit these woods. During the three winter months the sun is never seen here; being entirely hid by the height of the surrounding hills. …a very small parish, in Carhampton hundred, 3 miles WNW from Porlock; containing 10 inhabited houses, and 11 families, 6 of whom are employed in agriculture. This parish is environed on every side by mountains, which rise so high as to render the sun invisible nearly three months in the year, and for the same reason it is not possible to approach it on horseback without danger. The church is a neat Gothic building situated in a narrow cove, surrounded with hills, ascending almost perpendicular to the height of 1200 feet, and covered with oaks, beech, ash, poplars, pines and firs, mingled together by the hand of nature in the most picturesque manner; a beautiful rivulet rushes through a narrow channel in the interior of this cove, and passing the church, forms a succession of cascades as it flows down the rocks into the sea. Such are the environs – bar poplarsto which I will not swear. And while to the Greenwoods this location’s picturesque, Collinson maintains it’s noble and romantick – tempting to readers of a walking habit. But in his Preface, Collinson gives something extra. Here, as prelude to his thirteen hundred pages, he sketches how a knowledge of Provincial History contributes to an understanding of our nation and shared human nature. With intuition I am in concurrence. This – in that it joins a person to the object of his contemplation – enobles that in us conjoins itself to what it witnesses in Nature. But did the Reverend’s mind ‘exult’, with pleasure and astonishment, in Culbone’s grandeur? Can rapture, after all – along with whortleberries and tiles and all the woodland species that he itemises – be classed as topographic information: as though the landscape, itself, were provisioned with the therewithal or substance of a visitor’s reaction to it and thus offered it to all who walked there to receive it equally? Still, Collinson’s in sympathy with the sublime. It’s to his taste – in moderation. And while he stands as mere spectator to those forms that might, were he receptive, rouse his passion, for me, because the chasm, crag and channel harmonise with what I’ve witnessed – and extremes of feeling thus excited – my impulseis to echo and reply, expand and imitate what nature sings, and so I chant back to her what she’s told me. The cascade rushes at some distance from the Reverend eye. The same torrent bursts into my heart – and conturbat me. 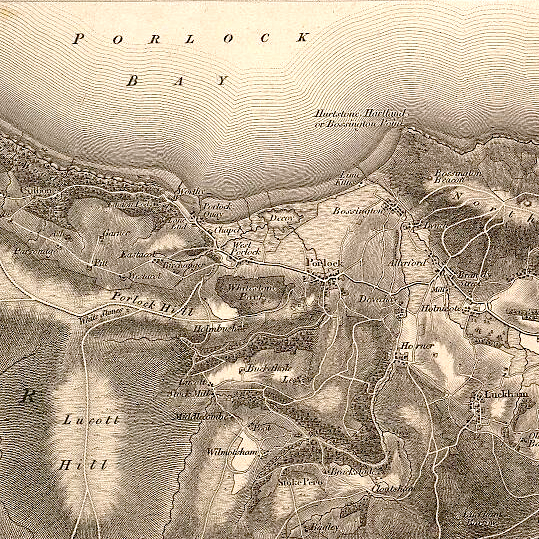 After several endeavours to form a topography of this County, the task has fallen to a Reverend gentleman, who has not in the ten years since his proposals appeared in 1781 been able to give such an account of it as becomes the duty of a county historian in this improved aerea of topographical research. The Topographical part of the work rests on inquiries made in many successive years by my late friend Mr. Edmund Rack, to whose assiduity I pay this merited acknowledgement. Now it’s not my intention to colly (blacken!) Collinson, who died in ’93, mortified perhaps by his reviewer. But my curiosity was roused concerning Rack’s place in these volumes. And more important, who it was had walked at Culbone and descanted on romance, astonishment and exultation. So, when next in Bath, I sought out Rack’s surviving papers. But I confess to a shock when I visited the rooms where Rack’s notes, brought there from Long-Ashton, were laid open to me. For the very first page revealed, verbatim, that account of Carhampton, with its Alps of Somerset, I’ve quoted. Alas. Those paragraphs that Collinson presents as his are reproduced from Rack exactly – who wrote them as he toured, alone and on foot, exposed to all weathers, suffocated by a cough – that terribly shook his poor, thin chest – the travelling exacerbated. This, in ’87, killed him. Now I won’t make Rack a martyr entirely. His experience of commerce was a fuel to the business. From home in Bath and from the field, Rack’s was the organising genius of the topographic enterprise. Established in Bath, Rack published a substantial book of Essays. This, intermixed with verses in accomplished couplets, was printed the year he set out on his topographical researches. NOW HERE’S THE enigma. With reputation high but his health in decline (he often writes that he is ‘poorly’), how was it that Rack, in his late middle years, should embark on such a walk until his demise in ‘87, albeit intermittently, through a hilly and extensive country? Thus Squire Bramble in Humphry Clinker. And so, like many of those decent families, Rack left on his perambulation. Armed with Bowen’s Improved Map and with a ‘Welch poney’ he acquired in Taunton, he travelled the county and surveyed every parish, its landscape, natural history, populations, agricultural practices and its architectural features. He subsisted on subscriptions he extracted from the gentlemen he interviewed on their estates and farming practice. And oh, were his shade to enter James’ Parade today and wander through the pages Collinson collated, he would recognise a book that he, in flesh and blood, had written! 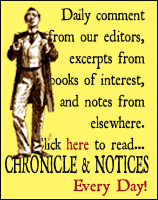 WE SHALL RETURN to Rack in Quaker character – when he’s arrived at Culbone and stands by the cataract, alive with his pen and stammering in admiration. But first, Rack leads me, and I follow willingly, to digress into a realm where he sings as poet. The seat of peace, of solitude, and thought. And droning insects hovered in the trees. To Sleep, who waved his poppies round, a prey. But free remained the ever-active mind. The power who o’er their sweetest lays presides. Some power unseen directs my towering wing. And flowers immortal decked th’enchanted ground. And strains harmonious float along the tide. In sacred pomp, and glittering seek the skies. The goddess FANCY here extends her reign. The work of ages, raised by FANCY’s hands. Her own creation round in prospect lies. And all its splendors opened in our view. In rear half-circled by a gloomy wood. Flounce in the stream, or shoot along the tide. Not without change a moment it remains. High rose the roof; a vast stupendous Dome! The spacious vault a thousand lamps illume. Flows o’er her limbs, and floats in glittering folds below. With power endued, surpassing human thought. For in its field she saw whate’er she pleased. The varying labours of her changeful mind. The fervent heat of true poetic fire. And blazed refulgent in the Grecian sage. That Tasso felt, when magic scenes he drew. Which Lucan thought he felt and Ovid knew. And soothe the secret springs of FANCY’s soul. Through all the temples, all th’ inchanted plains. Which instant in a thousand fragments broke. The shining spoils lay glitt’ring on the ground. But one vast dreary desart spread around. NOW MUCH OF Rack’s Vision’s in an ornamented language – from which fustian I’ve extracted passages that breathe out freely from what’s suffocating otherwise. At the first view, the mind is usually overwhelmed with a tumult of wonder and delight: – a confusion of images, a rapid succession of ideas, for which language wants a name; – a transport of astonishment which seizes all the faculties of the soul. But by degrees the sensations become less violent and more pleasing: astonishment is succeeded by a calmer delight, and transport subsides into reverent and pleasing admiration. Wonderful! No finer, more discrimating passage. And in view of later exposition on the subject, note Rack wrote this ca. 1780. Rack strove to write, like Woolman, with an ethical simplicity. And just as the American had walked intoning Psalmsalone and to both African and Cherokee, so Rack, Tremblingly alive all o’er, and stained no longer with the (literary) dyes that Woolman had disdained, walked naked of ambition in a Quakerly devotion, and – open in his solitude to the Creation – stood by the chasm and swallowed down its torrent. The Earth is the Lord’s and all the creatures in it. I will bless his works in all places, Rack re-articulates the Psalmist. Where power supreme and art immortal shine. Capacious beds, where rapid waters flow. Refresh and fructify the thirsty plains. Thus from a poetic complication, Rack extracted, or reverted to, a deeper plainness. He abandoned the couplet. The Dome he’d erected in imagination shattered. The Quaker in him from it hatched as Adam. So Rack walked – and walking shook his spirit as it had John Woolman’s – naming what creation as it stood, so far, in Somerset this century, spoke to him and which he answered, annotating that which lay outside him and (poor fellow) desolately coughing. ‘So shaken as we are…’ The line recurs. RACK’S LABOUR ENDED after six years’ walking. He met endless discomfort – not least, ‘a thousand fleas’, he cried out, biting him at Compton Martin. Sharp blows the wintry wind. The Doppelgängers of each other’s opus? This is an excerpt from From Culbone Wood – in Xanadu, published by Shearsman Books in February 2013. Passages about Thomas the Rhymer and Doppelgänger occur in previous sections of the text. 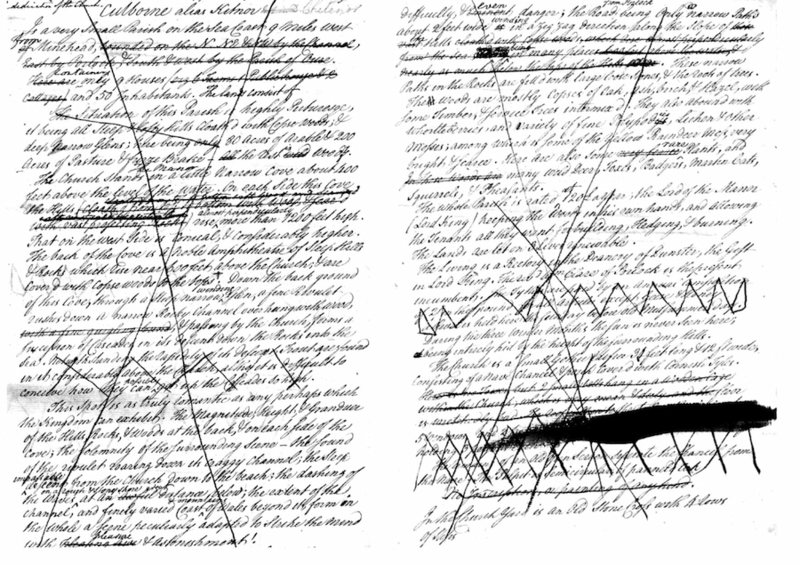 A further excerpt, ‘Notes taken from an Alpine landscape’, appears here. Tom Lowenstein was born near London in 1941 and educated at Cambridge. He has worked since the mid-1960s as a teacher. Between 1973 and 1989 he recorded materials deriving from intermittent residence in an Inupiaq (north Alaskan Eskimo) village. 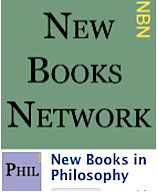 Previous publications include three books of poetry: Filibustering in Samsara (The Many Press), Ancestors and Species and Conversation with Murasaki (Shearsman Books). His publications on Point Hope include The Things That Were Said of Them (University of California Press 1990), Ancient Land: Sacred Whale (Bloomsbury, Farrar Strauss and Harvill, 1993-2001) and Ultimate Americans: Point Hope, Alaska 1826-1909 (University of Alaska Press, 2009). Edward Dowden: Coleridge as a poet. Andrew Mitchell: On the road to Panstisocracy. 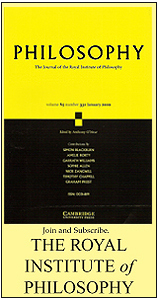 This Fortnightly Review article is filed under the following rubrics: Biography and Memoir, Excerpts & Passages, Poetry & Fiction, Principal Articles. Publication: Sunday, 28 October 2012, at 13:04.